Adorable cottage in private wooded neighborhood just 7/10 of mile from charming Glen Arbor in the heart of Sleeping Bear National Lakeshore, recently voted America's most beautiful place by Good Morning America. Bear Hollow sits on a quiet, safe cul-de-sac that has a private access to a beautiful beach on Sleeping Bear Bay. There one can enjoy fun in the sun, gorgeous Lake Michigan water & sunsets and starry campfires at night. Sleeping Bear Bay is known for all kinds of boating, sailing, fishing and climbing the Sleeping Bear Dunes. Bear Hollow is a tasteful cottage set up almost like a ski chalet. The main floor has family room, kitchen, dining room, laundry and a full bathroom. There is a twin size inflatable bed that sets up in 3 minutes. The living room has a fire place, flat screen TV, DVD streaming player with a built in Netflix account. The whole house has free WiFi. Upstairs is two bedrooms and full bathroom. The master bedroom is an open loft with a ceiling fan, king size bed and full walk in closet. The other bedroom has two twin beds, fan and an ihome player alarm clock. Enjoy the outdoor seating in the front of the house to read a book of enjoy conversation while taking in the peace and natural surrounding. Out back is a patio with dining table and BBQ for outdoor cook-outs! Bear Hollow is centrally located to all you want in Northern Michigan! Come see our little slice of heaven! We have owned our home on Sleeping Bear Bay since 1978! My wife and her family has been coming up north her whole life! Sleeping Bear Bay holds a special place in our hearts. Most of Arbor Pines is owned by my wife's family and extended family. We all attended University of Michigan and have maize and blue running in our blood! We bought Bear Hollow because its located directly behind our property in the hopes that one day we will need it to house an overflow of family and grandchildren! Enjoy a comfortable, peaceful stay in our fully loaded cottage for all needs! Centrally located to all the reasons tourists visit the Sleeping Bear area. Town, Lake Michigan, Sand Dunes and the Heritage Trail are all STEPS FROM BEAR HOLLOW!! We loved our time at Bear Hollow. Communication was easy and check and and check out were a breeze. It was the perfect size for our family of four (kids 7 and 5), with nice amenities including laundry detergent and dishwasher pods, fluffy towels, some plastic dishes along with the nice ones (great for little hands), and comfy beds. The lack of air conditioning wasn't a problem as we opened the windows at night and closed everything up during the day. The shade provided coolness and the ceiling fans helped too. The beach access was great. Getting to the bike trail was a little confusing because the entry point was grown over, but we managed to find it. The mosquitos were too bad to hang out on the deck, but that's to be expected for northern Michigan this time of year. All in all it was a wonderful experience and we will definitely be back. Thanks to our wonderful hosts! Stunning setting and a beautiful house!! My wife and I and our two adult daughters stayed at Bear Hollow. We had a wonderful vacation. Part of why we enjoyed it so much was this great little cottage. It is a very well maintained property and was very clean when we arrived. And was completely outfitted with everything you would need for the week. From hand soap to kitchen towels to an abundance of bath towels. It was about a 2 minute stroll to the private beach with beautiful views of Lake Michigan. One thing we really enjoyed was walking into downtown Glen Arbor for shopping and dinner. Our favorite place is sitting outside at Art's Tavern. We also enjoyed a hearty breakfast at Art's before heading up to Cathead Bay in Northport to search for Petoskey stones. Thank you so much for the use of Bear Hollow. Our family of 6 had a great stay. The families around us were very friendly and we loved spending a day charter fishing with Captain McDaid at Reel Tales-he lives right down the street! This is s perfect home for a family with a couple of kids. We didn't realize the master bedroom didn't have a door and had a loft, so because we had 2 kids sleeping on the sofa and 2 in the 2nd bedroom, there was very little privacy or ability to do anything after the kids had gone to bed. In other words, it wasn't the best space for us, but we loved everything else about it. Great kitchen and amenities and a lovely quiet beach. We also really appreciated the quick response we got when we had questions or needed extras, like another blanket etc. This attractive, compact house well served our needs for a quiet couples' getaway and family time with our adult kids. The owner was accomodating, and helpful from her house across the lane, the kitchen was very well stocked, the beds and bedrooms were super comfortable, and the furnishings were attractive. We heard bird sounds late into the night and early morning. The best feature was the very close proximity to Glen Arbor--still far enough away to be quiet and peaceful--and to and historical Glen Haven, and--BEST-- the Heritage Biking Trail which we rode every day. We used the Glen Haven beach for more privacy than the short beach which comes with the house. Not a place for outdoor play (mosquitoes). No air-conditioning but the ceiling fans work great. This is a very good house for the value. We loved our stay at Bear Hollow! The house is neat, clean and everything we needed! Thank you for a wonderful stay, we will be back next year! Bear Hollow is located literally 900 feet from the Sleeping Bear Heritage Trail. A 25 mile paved path rolling throughout the Sleeping Bear sand dunes, forests and countryside of our beautiful national lakeshore!! Great for hiking, biking, walking & running! Downtown Glen Arbor is 5 minute bike ride or 15 minute walk. 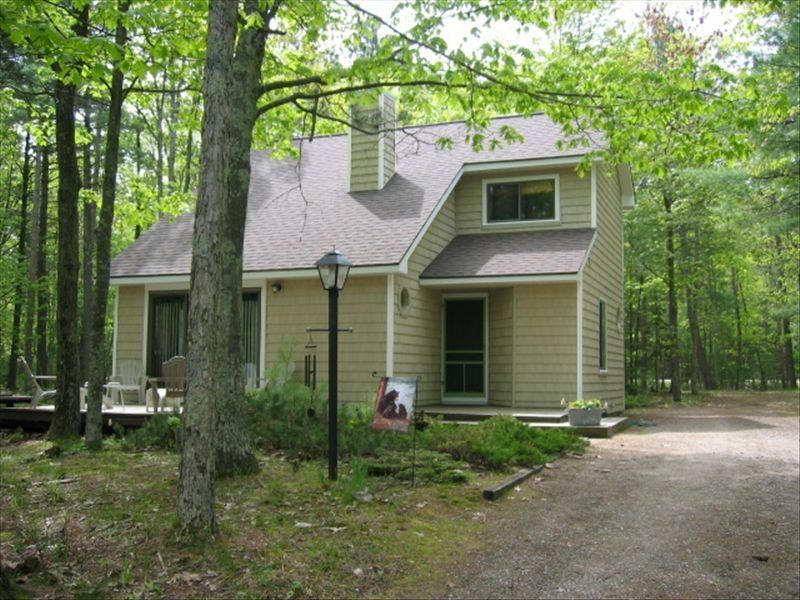 Bear Hollow is located on a cul-de-sac with a private access to a beautiful beach on Sleeping Bear Bay!